FOLLOW TRIPAWDS ARE YOU A FAN? » NEWS » BLOGS » FORUMS » LIVE CHAT » START YOUR BLOG! Shopping on Amazon? Please start here to support Tripawds! Browse all designs in the Tripawds Gifts Blog! Visit the Tripawds Featured Blogs for more gifts, gear, books and other helpful resources! Got questions? Call 1-877-809-1659 to order by phone! See All Custom Tripawds Jewelry! All purchases help maintain the free Tripawds Blogs community and discussion forums for three legged dogs and their people. » Are You A Fan? Download Tripawds e-books for fast answers to most common questions! Rear Leg Tripod Dogs Might Be Missing a Leg But That Sure Doesn't Stop Them! Check the other shop sections at left for more rear-leg apparel and gifts or browse all designs here. Your purchase helps support his Tripawds community and Discussion Forums for tripod dogs and bone cancer survivors. Goldie Tripod Big Dogs Lovin' Life on Three Legs! Three legged dogs have the power to make people smile. Three Legged Pit Bulls Prove Tripawds Rock! Rear leg Tripawds Rule design for Labrador lovers. Rear Leg Tripawd Amputee Dogs Stand Proud. Tripawd Cats Say Be Calm! Three Legged German Shepherds Have A Ball! 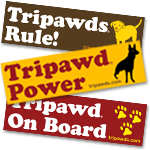 ® 2006-Present TRIPAWDs is a registered trademark and all designs are copyright of Agreda Communications.